The historic city of Utrecht lies in the centre of the Netherlands and is about 45km south of Amsterdam. Utrecht Central Station is the main domestic railway hub of the country with direct rail services to most of the major Dutch cities. There are also some international trains and coaches serving Utrecht. There is a regular Intercity rail service (up to 4x hourly) from Schiphol Airport to Utrecht Central which first makes stops at Amsterdam Zuid and Amsterdam Bijlmer. From Utrecht, the trains continue south to either Nijmegen (via Arnhem) or Venlo (via ‘s-Hertogenbosch and Eindhoven). The Schiphol-Utrecht journey takes just over 30 minutes and costs €9.20 (2nd class) and €15.18 (1st class). A taxi from Schiphol to Utrecht would normally cost around €90 on the meter. Some companies can offer lower fixed fares. For example, local Utrecht taxi company UTC (+31(0)30 2300 400) has a fixed €59 Utrecht-Schiphol fare either way if booked in advance. Intercity services (direction Heerlen, Maastricht and Nijmegen) run up to every 10 minutes from Amsterdam Central to Utrecht Central. The journey takes around 26 minutes with a single stop at Amsterdam Amstel. One-way tickets cost €8.00 (2nd class) and €13.20 (1st class). It is also possible to travel on the non-stop ICE international service between Amsterdam and Utrecht (24 minutes, runs every 2 hours) if paying the domestic supplement of €2.40. There is a 4x hourly service from Rotterdam which goes to Utrecht via Rotterdam Alexander and Gouda. This 37 minute trip costs €11.00 (2nd class) or €18.15 (1st class). Some trains continue to either Groningen or Leeuwarden. If you are heading to Utrecht by rail from France/Belgium/UK – then you should change at Rotterdam and not Amsterdam. This can include Eurostar passengers from London, Thalys passengers from Paris/Brussels/Antwerp and Intercity Brussels passengers from Brussels/Antwerp. Intercity services run from Eindhoven to Utrecht Central via ‘s-Hertogenbosch up to 6x hourly (direction either Schiphol Airport or Alkmaar, Schagen or Enkhuizen). The 50 minute trip costs €15.20 (2nd class) and €25.08 (1st class). All above prices are valid for 2019. There is a €1 surcharge to purchase disposable train tickets – see our guide how to buy a Dutch train ticket. There are hourly night trains running to/from Utrecht which serve the cities mentioned. The regular ICE International train between Frankfurt/Cologne/Dusseldorf and Amsterdam makes a stop at Utrecht Central. There is also a daily ICE service to/from Basel in Switzerland. Utrecht Central Station and the surrounding area has been undergoing a significant renovation for many years. Upstairs from the rail platforms is the main hall which has a spectacular undulating roof. Here you will find the gates for checking-in/out with OV-chip card tickets. The station hall has 2 travel centres for NS domestic/international rail tickets and local Utrecht public transport tickets; station facilities include ATM machines, a bureau-de-change, toilets and left luggage lockers; various shops include AKO newsagents, Albert Heijn To Go mini supermarkets, ETOS chemist, HEMA and Holland & Barrett store. There are a good number of cafés, restaurant and fast food outlets. If heading towards Utrecht city centre, leave via the new covered pavilion square at Stationsplein-Oost (located past platforms 1-4 and the city-side U-OV bus station). Then continue walking through the redeveloped Hoog Catharijne shopping centre which will get you to Vredenburg square. At Stationsplein-Oost there are a host of new international chain restaurants open which include Wagamama, Vapiano and TGI Fridays. The opposite end of the station (past platform 20) leads you to the Jaarbeursplein (near the Jaarbeurs Exhibition & Convention Centre) where you will find more U-OV city buses, a taxi rank, U-OV trams to Nieuwegein and IJsselstein and regional/international bus services. There is an outside walkway which connects Stationplein-Oost and Jaarbeurs. Note, the Jaarbeurs area is also currently under heavy construction. 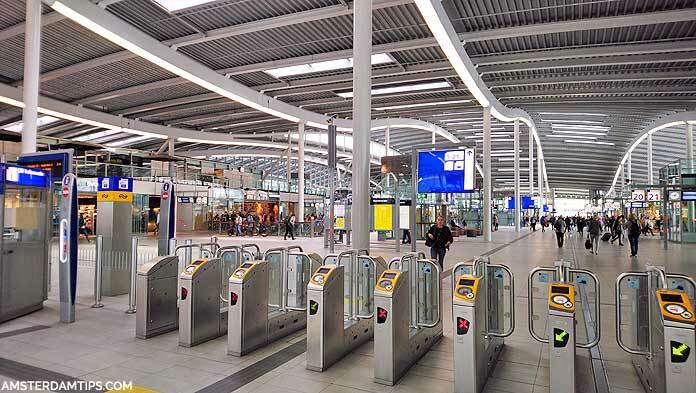 Utrecht Central Station has the biggest bike parking facility in the world, which has a capacity of 12,500 bikes. Eurolines – There is a 2x daily coach serving London Victoria (a day service and an overnight service). There are also direct Eurolines services from Utrecht to Brussels, Paris, Berlin, Düsseldorf, Cologne, Frankfurt, Prague and Barcelona. Onward connections throughout Europe are possible. Flixbus – The German bus company also operates coach services to/from Utrecht including Antwerp, Paris and a variety of German cities. The bus stop is near the NH Hotel. Brabant Liner – This is a domestic intercity bus (services 401 run by Arriva) which travels between Utrecht and the southern city of Breda. The journey takes about 90 minutes. In Breda, the bus arrives just outside the railway station. NS replacement buses – During periods of maintenance and/or service disruptions, rail replacement buses run from Jaarbeursplein. We don’t particularly recommend visitors drive into Utrecht if they only need to visit the city centre. Utrecht car parking rates are expensive and some roads only allow travel by buses and taxis. Consider using one of the Park & Ride (P+R) schemes around the city periphary. These charge €5 for car parking which also includes public transport tickets into the city for up to 5 people. Locations are P+R Westraven, P+R De Uithof, P+R Papendorp and from mid-2018 P+R Leidsche Rijn. Utrecht is a Dutch motorway hub surrounded by the following roads – the A2, the major north-south artery linking Amsterdam to Maastricht; the A12 linking Arnhem and Den Haag; the A27 which connects Almere to Breda and the A28 which goes to Groningen via Amersfoort and Zwolle.